Carova where large numbers of people and vehicles mix on a daily basis during the summer tourist season. Heading to the Carova area of the Currituck Banks? If so, be sure to get a permit before parking on the beach. Beginning this weekend—Memorial Day—a permit is required for anyone who is parking on the Carova beach. The very important word in that sentence is parking. In other words, if a family is planning on driving to the 4WD area, and stopping to go swimming or fishing, a permit will be needed. However, no permit is needed for an excursion to Carova if there is no stopping on the beach. If, as an example, this is a family trip to the 4WD area where the Corolla Wild Horses roam, and the hope is to see how many horses can be found—no permit is required for the expedition. This is an attempt by Currituck County to get a handle on summertime beach traffic north of Corolla. In the summer the beach often seems more like a highway than a place where a family can relax and enjoy their time by the sea. There are some rules and regulations governing who will need a permit, and how to get them. Here’s the information from the Currituck County website. 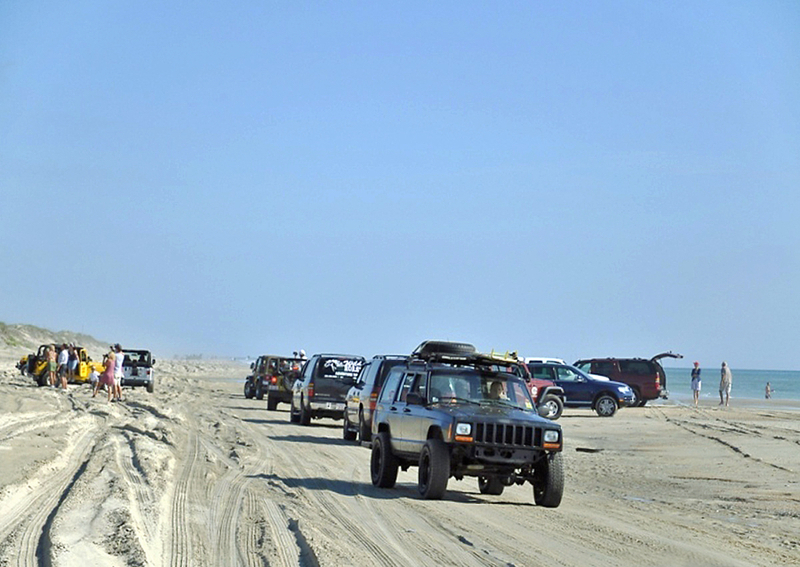 Beachgoers who wish to park (we added the emphasis) on Currituck County’s four-wheel drive beach this summer will need a county-issued beach parking permit displayed on their motor vehicle. This new permit system was adopted by the Board of Commissioners in an effort to increase safety in the four-wheel drive area, where large numbers of people and vehicles mix on a daily basis during the summer tourist season. All county residents and property owners may receive a free Seasonal permit for each vehicle they own by providing proof of ownership and current liability insurance. The permits will be issued specific to each vehicle. County residents who live full-time on the off road area north of the North Beach Access Ramp may obtain two additional Guest permits. These permits will not be specific to a motor vehicle and may be used by guests of the resident. All others must pay a fee for a beach parking permit. These permits will be available for purchase from the Tourism Department on a temporary or seasonal basis. Seasonal – This permit is assigned to a specific vehicle and is good for the entire vacation season. Seasonal permits are free to county residents and property owners. Others may purchase a Seasonal permit for $150. 10-Day – This permit is available for purchase ($50) by individuals who want to park on the four-wheel drive beach but are not Currituck County residents or property owners and are not renting a home on the off-road area. This would apply to day-visitors or those staying anywhere other than the 4-wheel drive beach. Check out Joe Lamb Jr., & Associates. for the best locations on the Outer Banks.